Alabama senate race Archives | Rich TAkes! I’ve been workin’ on the railroad, all the live-long day! Is Roy Moore being rail-roaded? It sure looks like it. 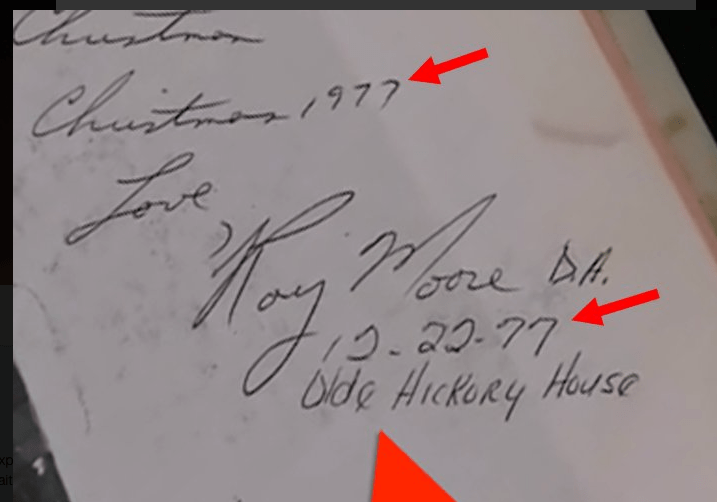 Unless Moore’s handwriting has changed, the yearbook signature is a forgery. I’m pretty sure this yearbook “evidence” is from Gloria Allred’s fifth accuser (actually 3 of the first 4 had nothing to accuse Moore of in fact, most claimed that Moore treated them each like a gentleman) who claimed that Moore offered to give her a ride home from her waitress gig, and instead drove around to the back of the restaurant to put the move on her. It wasn’t happening, and then her boy friend who showed up late arrived just in the nick of time? Or something. Supposedly, this woman had no further dealings with Roy Moore, and Allred offered up this year book note as evidence, with the date written twice in what to appears to be a forgery. The “7s” are obviously different, and “Olde Hickory” (the name of the BBQ joint) seems to be mis-spelled. What are the odds of a BBQ joint in Alabama using Olde English spelling? Moore’s lawyers held a presser today to demand that Allred submit the yearbook in question to a hand-writing expert, and they are welcome to bring their own too. Fine and dandy. It sounds fair to me, and I suspect that would also sound fair to most people. That is not what caught my ear or eye either for that matter. 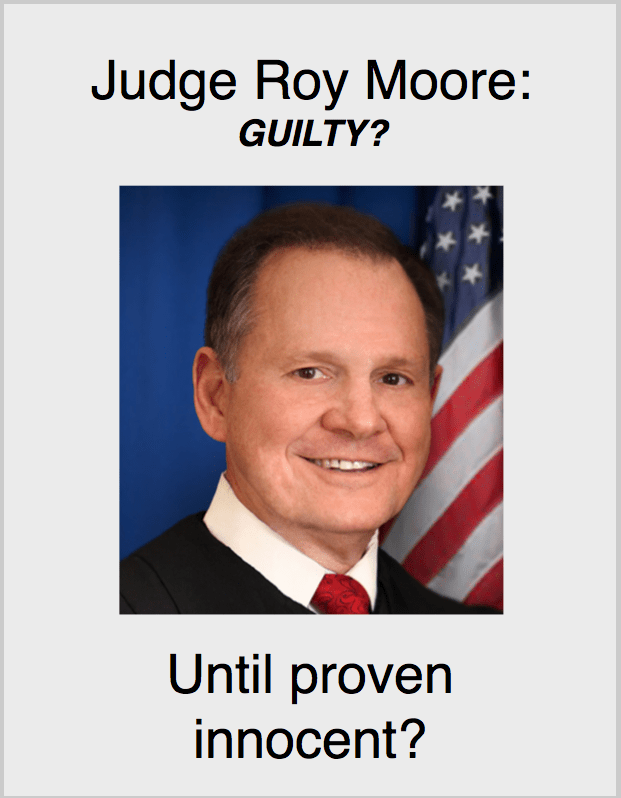 The signature is what is most relevant here, where it reads, “Roy Moore D.A.” Moore was not a DA at that time, although he was an Assistant District Attorney. An ADA is an entry level lawyer in the District Attorney’s Office who performs everyday trial work. Moore’s lawyers in the presser said that Moore told them that he did not recall ever signing “D.A.” after his name, but that he had seen that before. It turns out that he was the presiding judge for this accuser’s divorce granted in 1999. The “D.A.” were the initials of his legal assistant who affixed his signature to mundane Court Decrees, Deborah Allen. Scroll back on this guy’s feed for more info about Moore, he seems to have done a lot of legit research. McConnell spent 32 million to attempt to install Luther Strange, and the People of Alabama weren’t having it. Moore won the special election in a land-slide. McConnell also spent millions smearing the other conservative candidate in the special election primary, Mo Brooks. McConnell has lost all around, and is now using every dirty trick in the book to disenfranchise the Alabama voters and get the governor to appoint, or elect a write in Luther Strange, because he needs a lap-dog. McConnell stated years ago that he would put down the TEA Party, and he has been pretty successful at it. He doesn’t want any more Ted Cruz, Mike Lee, Rand Pauls, or anyone else who will not toe the party line. That is what this is really all about.